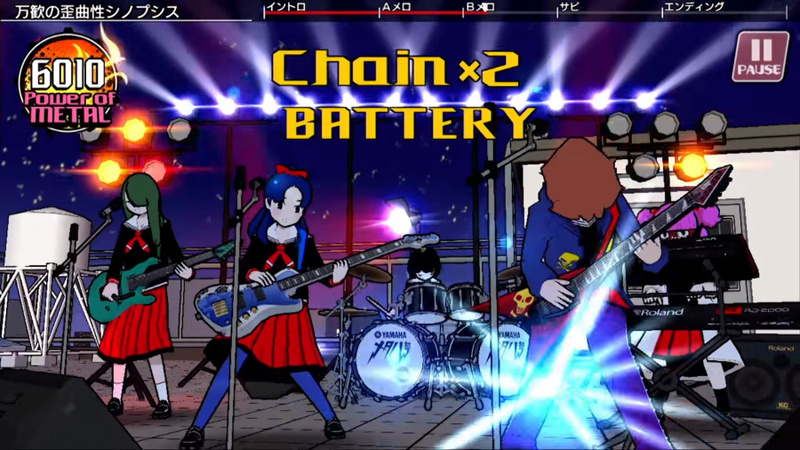 "There are no rules and no limit"
Since its reveal in September, Gal Metal - an exclusive music rhythm game from Japanese gaming industry treasure Tak Fujii - has gained the attention of Nintendo Switch fans for myriad reasons. Most interesting is the fact that the game uses the technology in the Joy-Con controllers to mimic the playing of drums. We chatted to Tak and had some hands-on time with the title, due for release in Japan on 8th February. Nintendo Life: So, what's the story of Gal Metal? Tak Fujii: There are actually parallel stories. On the one hand, some gold records have been stored on a Voyager satellite orbiting the Earth, but there was a mistake. Instead of classics like Chuck Berry, the record collection is made up exclusively of metal tunes. An unsuspecting group of octopus aliens experience this metal music and seek revenge on earth for subjecting them to this head-banging heresy. The comic book story introduces us to the invasion. On the other hand, you are dealing with how you make a band and how you deal with a big problems within the band. 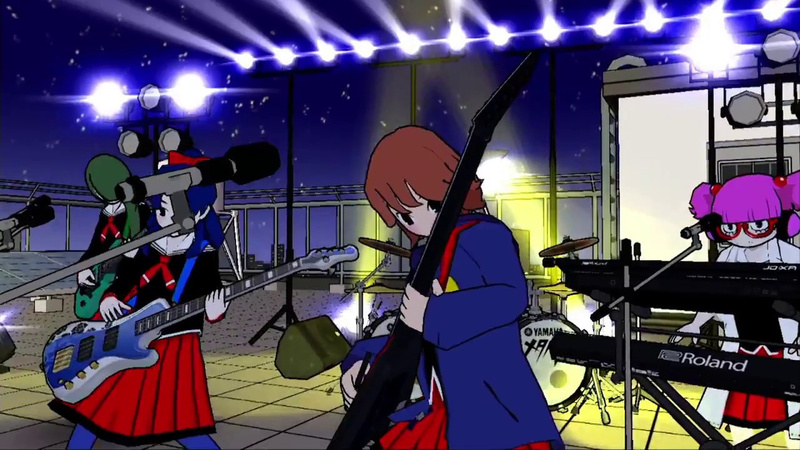 In this case, for the high school girl band, it is the pretty big problem of an alien invasion. There are some dialogue choices which affect the game in terms of the main story a minor way. There are a few different play modes in the story, such as not hearing the metronome or only using one hand. It relies on Japanese comic book culture; the teenager as the hero and admittedly it is a silly story, but it's not the main focus. The individual character that you play is a boy but in a girl's body, dealing with typical high school student troubles. It's not really swapping gender; you live together in the same body. You have to go to a girl's school. There are a few shocks. What are we going to do about the aliens?! The girl is the drummer in a metal band, But the boy can't play the drums, so she will be teaching you how to play the drums. The story Was written by Shuho Imai, director and writer of PlayStation Vita title Tokyo Twilight Ghost Hunters. Can you explain how the Joy-Cons are used in the game? When you play the drums, you don't play the same rhythm so you have to combine two or thre rhythms in a bar or phrase to increase your score. Don't trust your eye or base your judgement so much on the indicators on screen. At the top of the screen, there is a menu bar at the top with a chart. There are 30-40 different patterns to unlock which increase in complexity, but in terms of playing the songs, it's up to you. There are different categories of rhythms, such as abyss, rage, beast splash and chaos, split into groups of 2-2, 4-4, 6-8 (and so on) timing. You can build up your ability to play different rhythms to use in a song. So the game starts by introducing two different rudiments. A simple 4-4 timing called 'Harlot' using the right Joy-Con as the bass drum, the second was 'Enter Sand' which introduces alternating the bass and the snare (left Joy-Con). Later on, we introduce swinging both Joy-Con together for the cymbals. Finally, the tutorial asks you to use both rhythms alternately. During any song, you can alternate between rhythm by yourself, or even try your own. It is also possible to swap the snare for the bass drum, and vice versa. Why did you decide on the manga art style? We are not trying to make things photorealistic. Manga style graphics are quite simple; maybe many people think the graphics are old but it's in line with the emphasis of not concentrating on the screen. Why this style? To have fun with it. The graphics aren't the focus. The graphics of something like Just Dance are vibrant, stylised. The graphics shouldn't distract from what you're doing. People are always saying 'What do I do?' Looking for instructions. With games like Guitar Hero there is too much focus on looking at the screen. It's more like the philosophy of 1-2-Switch, taking the game off of the screen. Music is about listening. There shouldn't be indicators. The Switch is also a portable device, and having indicators would mean you have to see if it is right or wrong. The screen doesn't mean anything in this game; you need to watch the player, their movement, which is fun! I believe that is the main fun part of the game. In real terms, there are three ways to progress: getting through the story, playing through the songs or just learning the drum patterns and freestyle. At this point in the interview, we're allowed to have a go ourselves and we jump straight into the action. Instinctively, we look at the screen, but there are no instructions. "Don't look at the screen - listen!" Tak says. As we think we are progressing well through the song, Tak gives us a little advice. "You are getting only that amount of points because you are only playing one rhythm." Tak leans back with a smirk. We found the best way to play is to hold the Joy-Con flat. It is natural to hold it with your full hand, but it is possible to hold it in a couple of different ways to achieve a few 'tricks'. Tak teased how to do double bass on social media. After seeing it first hand, there are much more advanced rhythms and techniques to learn, but we're told, "You'll have to figure that out for yourself...!" Later on, we're shown that there is a difference in the sound as to how forcefully you swing the Joy-Con. There is certainly a knack to finding the right action or space, especially considering that it is initially weird to not actually hit anything. 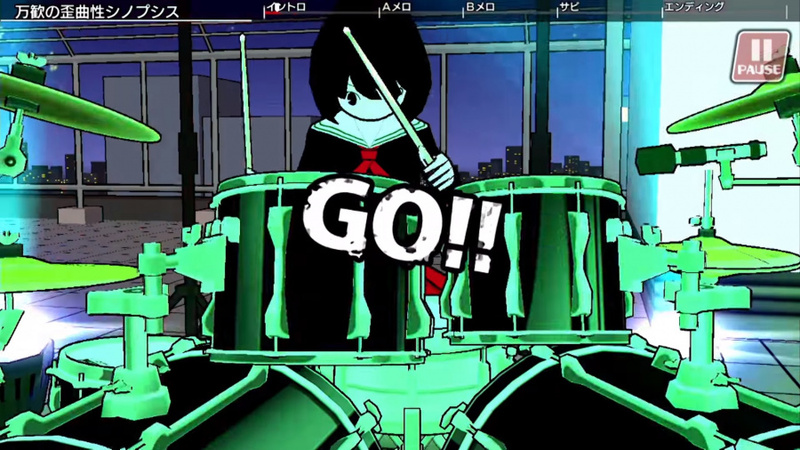 The game is designed to register the swing and hit of the drum, not pressing a button. After two songs, it was clear that the similarity was not to games such as Guitar Hero, that focus on punishing failure or mistakes. The comparison made while playing was to the Tony Hawk series, focusing on the notions of building combinations, experimentation and variation. Immediately, we think up a few party game scenarios - where two people have a Joy-Con each, or entering into a game of one-up-manship, trying to beat each other's score, or even being used as an accompaniment to a karaoke night. Due to how the game is set up in its demonstration unit, there's a slight delay when attempting to go through the tutorial. Playing the actual song once we get a sense of timing was much better. It does feel strange not hitting a physical drum and takes a little getting used to, but it's more responsive than previously thought. The more advanced rhythms really show off what's possible, but what's even more interesting is that there is no set chart to follow, and the idea that there's no 'punishment for failure' is particularly cool. Upon completion, is there a comprehensive review of what beats you've done, and different parts of the song you've done well in? The game really is going against the method of punishing missing the note. The main priority is having fun playing the drums. Apart from the metronome teaching you the rudiments and the timing in the tutorial, there is no actual guidance during the actual songs. We felt we had to put some kind of number-based score in there, but it's not the goal. The goal is how you improve, it's how you make up your original music rhythm. It's liberating and it feels good. What artists or songs are in the game? There are metal covers of classical songs from Bach and Beethoven, but the focus on what artists or songs are on it wasn't important in terms of getting a name - it's classic for a reason! Music games based on notes, like piano or guitar music games try to decrease the player's score from the top, whereas this game you're building your score from the bottom. Could we see this game come to the west? Localisation is hard because of how comics are read in Japan - from right to left, not left to right. If we bring to the west, text will have to be turned around and translated; it is easier to have subtitles, but not ideal. We would like to thank Tak & Maiko for their time and Ty Shughart from The Famicast for his assistance. Jon is such a Nintendo fan, he named his son Yoshi, and has been scouring the streets of Tokyo in search of the most random gaming stores and paraphernalia since 2011. He has a fear of identical twins, does a terrible Christopher Walken impression and still wonders why there is no block fort. Wow... This game looks bad. I'll keep an eye on it but probably going to pass. Yay, gender bending! I love you, Japan. Looks very responsive and fun! I love how excited the japanese guy in the video is. Even though I sort of dislike the kind of music in the vid, I get that itch to tap along to it. Might be a very fun game in fact, if the interesting concept is well executed. "We made the decision to not use recent famous music, especially rock or metal music, because there is already an answer, a 'correct' answer to how the song is played. There are no rules and no limit. We want to see players seeing someone on YouTube and going 'WOW, I want to beat this guy!'" yeah..no. you just didn't want to pay any licensing fees. Gimme DrumMania from Konami for Switch ! @manu0 I'm usually cynical, but I actually appreciated his answer. He made a very good point. The story sounds like it would be an fun anime. I love anime silliness like this. But the game doesn't sound like the kind of gameplay I would enjoy. Pass, but would watch an anime adaptation. This game is never going to be released in the West. You just only need to look at the comments here to know why. The game looks bad? It looks pretty enough for what it intends to do. I couldn’t care less about “photorealistic” graphics in game like this. 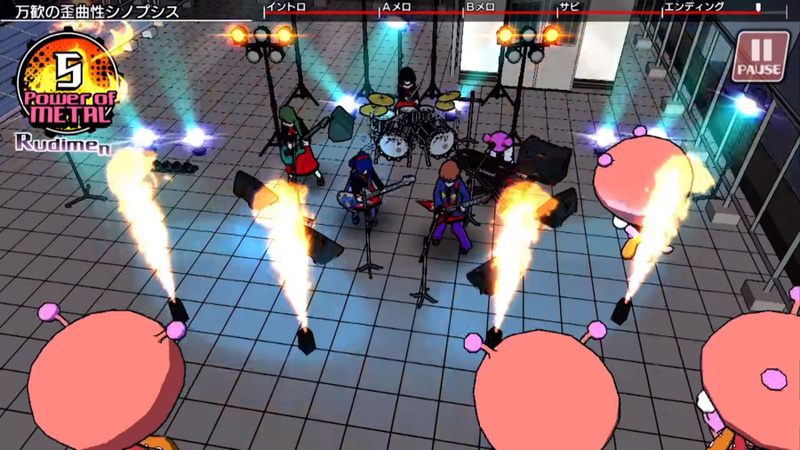 The game is very niche, since will only attract people who like metal or drums but it looks like a lot of fun and a truly stress reliever. In Japan people are way more excited about this game than the West will ever be, it’s clear for the comments here. By the way, the video with Marty Freedman (do you people know who is he? Probably not if you’re not a metal fan) is just awesome! I watched it when Young Guitar put it out and that alone made me want to try the game. I can’t imagine a better way to release some steam after a hard day. 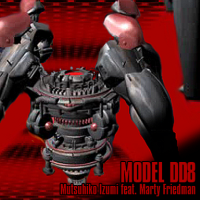 "By the way, the video with Marty Freedman "
Don't forget His collaboration with Mutsuhiko Izumi from Konami with their song on DrumMania V4, MODEL DD8. Megadeath.. tbh I quite liked the look and fun aspect of this game. It's not taking itself too seriously id give it to myself. Wow, that sounds like it's exactly what I need! Since learning to play the drums a little bit many years ago I always tend to play air-drums while listening to music or dancing to it. I kinda miss playing the drums again. So I guess this would be a perfect substitute! And it would be the second outstanding, unique music game on the Switch. I think I'll just buy it from the Japanese eshop in February. It's all about the music after all (and I'm already learning with Hiragana Pixel Party ). Started to read the article & started thinking "K-On"... got to the bit about aliens & it all went a bit Haruhi Suzumiya. I hope this game is fun! The graphics aren't too important for this kind of game, but they look more "plain" than simple, doesn't seem to have much personality. I think this game would need a demo before heading westwards to get people hooked. I might be up for this, but I'm afraid of the freeform mechanics calling me out as a poser, Lol. It's listed on the eshop to preorder for 5378 yen, about 40 Euros. It's out on 08.02.2018. If you can read Hiragana and Katakana, it should be playable. Of course you wouldn't understand the story. I've watched a few more videos and I will definitely buy this one. Looks awesome! This is amazing and I need it now! 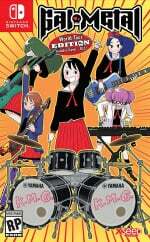 Japan, metal, manga and drums! What could be a better combo?! Those who think it's cheap gameplay, have you watched the video until 10 minute mark? The controls look unbelievably responsive and the guy just ROCKS. MARTY FRIEDMAN!!!! A very well respected world class musician. Megadeth hasn't been the same without him. I can't remember the last time he spoke English, lol. Fun watching him playing with the Switch. I was hoping to find out that he did the soundtrack on the game. Why does everything Japanese need to be about school girls these days?